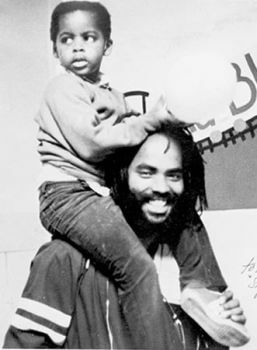 Political activist and journalist Mumia Abu-Jamal was born in Philadelphia, Pennsylvania on April 24, 1954. Born Wesley Cook, he took the name Mumia (“Prince”) in high school while taking a class on African cultures. In 1971, he added Abu-Jamal (“father of Jamal”) after the birth of his first son, Jamal. He has been married three times. Abu-Jamal’s first encounter with the police came when he was 14. He was beaten by a white Philadelphia police officer for disrupting a “George Wallace for President” rally in 1968. Eventually he dropped out of high school and joined the Philadelphia chapter of the Black Panther Party. Jamal was appointed BPP’s “Lieutenant of Information,” putting him in charge of the organization’s media relations and placing him on the radar for surveillance by the Federal Bureau of Investigation (FBI). He eventually earned his graduate equivalency high school degree (GED) and briefly attended Goddard College in Vermont. In 1975 Abu-Jamal began working for a series of radio stations, using his commentary on issues of the day to advocate for social change. Due to his growing popularity he was elected president of the Philadelphia Association of Black Journalists. Despite his popularity, Abu-Jamal was forced to take a second job as a taxi driver to supplement his income. Abu-Jamal became nationally prominent, however, when he was arrested for the murder of Philadelphia policeman Daniel Faulkner. On December 9, 1981, Faulkner was shot and killed during a routine traffic stop involving Jamal’s brother, William Cook. During the scuffle between Faulkner and Cook, Abu-Jamal also was shot and taken to Thomas Jefferson University Hospital. He was treated and then arrested and charged with first-degree murder. In June 1982, Abu-Jamal was tried. Despite conflicting testimony from key witnesses, Abu-Jamal was found guilty and sentenced to death. In 1994, Abu-Jamal returned to radio once again as a commentator for Prison Radio and for National Public Radio. His NPR commentaries were compiled in 1995 as part of Live from Death Row, which resulted in Abu-Jamal’s punishment of solitary confinement for engaging in entrepreneurship from prison. In 1999, Arnold Beverly admitted that he and an unnamed assailant, not Abu-Jamal, had shot Faulkner as part of a contracted killing because the officer was interfering with graft and payoff to corrupt police. Soon afterwards some prosecutors’ witnesses in the trial came forward and admitted that they lied under oath. Abu-Jamal and his supporters pressed for a new trial based on these recent developments. Their efforts paid off in 2008 when a three-judge panel reopened the case. The panel however chose to uphold the conviction, and Jamal is still in prison awaiting the death penalty. Mumia Abu-Jamal still maintains his innocence, and many people believe him, thus making him one of the most closely followed convicts in the world. Daniel R. Williams, Executing Justice: An Inside Account of the Case of Mumia Abu-Jamal (New York: St. Martin’s Press, 2001); Mumia Abu-Jamal and Noelle Hanrahan, All Things Censored (New York: Seven Stories Press, 2000), Mumi Abu-Jamal, We Want Freedom: A Life In The Black Panther Party (Cambridge, Massachusettes: South End Press, 2004); Mumia Abu-Jamal and John Edgar Wideman, Live from Death Row (Reading, MA: Addison-Wesley, 1995); “Mumia Abu-Jamal”, Contemporary Black Biography, Vol. 15 (Farmington Hills, MI: Gale Research, 1997).